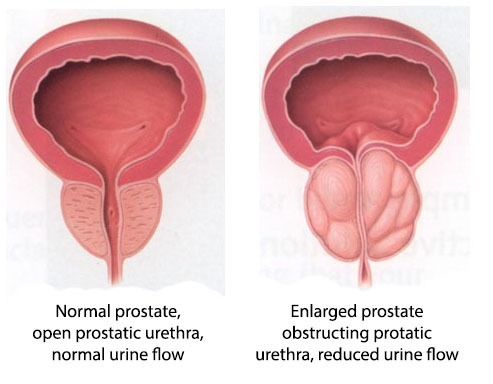 These symptoms are most often caused by obstruction of the urethra by an enlarging prostate gland. This is a normal part of the ageing process: most men will experience some enlargement of the prostate gland from age 50 onward. Benign prostatic hyperplasia: an enlarged prostate disrupts normal bladder function. The condition is called benign prostatic hyperplasia or BPH, and simply means a non-cancerous enlargement of the prostate gland. Many men present concerned that their symptoms of benign prostatic bladder neck obstruction may be indicative of early prostate cancer: early prostate cancer does not cause symptoms of bladder dysfunction. The decision to investigate and treat should be made on the basis of how severe your symptoms are rather than a fear of cancer.